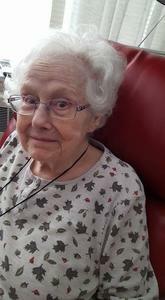 Mary Louise Jenkins died peacefully on Monday, March 12, at the Resthaven Care Center in Holland. Mary was born November 22, 1926 in Alum Creek, West Virginia, daughter of James Merrell Midkiff and Thelma Deel Midkiff. Mary attended Anderson (Indiana) College, studying Fine Arts. While there, she met her love and partner, Paul Jenkins, who preceded her in death in 2009. They were married in 1950 at Fifth Avenue Church of God in South Charleston, West Virginia with Paul’s father officiating at the ceremony. In 1952, Paul was ordained a minister and, for much of their life together, Mary and Paul worked alongside one another as partners in parish ministry. When first married, Paul taught Mary to cook. She always gave him credit, but her culinary skills quickly surpassed those of her teacher. She spent many hours in the kitchen, and especially enjoyed making candies at holidays (much to the delight of her family and her own “chocolate tooth”). Mary’s enjoyment of the role of pastor’s wife did not stop her from pursuing a career. In the early 1970’s, she began working as librarian for the Buckeye Boys Ranch in Grove City, Ohio. Such was her passion for this work that she returned to school, graduating from Ohio Dominican University with a degree in Library Science. She spent the remainder of her professional life working in the South-Western City School District of Franklin County, Ohio. Mary was an avid reader who instilled the love of books in both her sons, Stephen and Mark. For many years, she enjoyed reading Science Fiction, an interest she attributed to childhood enjoyment of Saturday Matinees with her hero, Buck Rogers in the 25th Century. More recently, her tastes turned to Romance novels. Mary is preceded in death by her husband, her parents, her sister Eloise Reveal and brother Richard Midkiff. Surviving her are her brother Richard's widow, Wanda Midkiff Smith; sons and daughters-in-law, Stephen and Eileen Jenkins of Holland, and Mark and Leigh Jenkins of Gregory, Michigan; grandchildren: David and Cynthia Jenkins of Corona, California, Elizabeth Jenkins and Jeremy Daum of Beijing, China, Sarah Jenkins and Matthew Locke of Buckingham, England, Emily and Jeremy Bastian of Salem Township, Michigan, Benjamin and Anthony Jenkins Wesley of Ann Arbor, Michigan; and five great-grandchildren. Cremation has taken place with ashes to be interred along with those of her husband, Paul, at Grace Episcopal Church at a later date. In lieu of flowers, contributions in Mary's memory may be made to Herrick District Library. Arrangements are by the Dykstra Funeral Home-Downtown Chapel.